The Pimpernel only wishes he was this Scarlet. When current Flash, Wally West, was seemingly absorbed into the Speed Force, this dark and mysterious speedster took up the name of the Flash and began tearing through the Rogue's Gallery. I created this member of the Flash Family after the story arc had finished, so I knew who the Dark Flash really was, and was able to create interchangable heads for him. 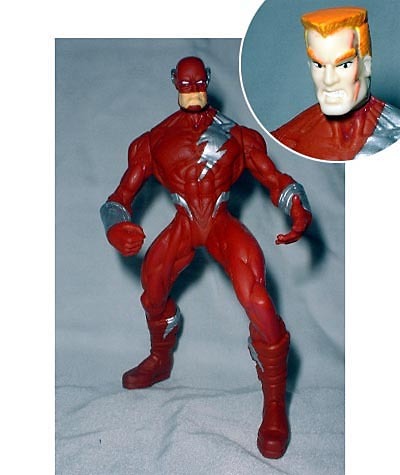 This is obviously just a repainted Total Justice Flash, but the unmasked head came from a Venom figure, with the proper scar painted on. Dark Flash has the Big Five in articulation, including his interchangable heads, and is about 5" tall. What's your favorite Flash story? Tell us on our message board, the Loafing Lounge.